Shannon Reed had endured harassment from her supervisor for months by the time the U.S. Forest Service started to roll out its latest plan to eliminate sexual misconduct and retaliation in the workplace. One of the strategies, mandatory listening sessions, was designed to allow employees to air concerns to agency leaders. For Reed, it meant having to share the room with her harasser. On Thursday, Reed told the House Oversight Committee about that listening session and the retaliation that followed her reports of harassment, including, she believes, the agency’s decision to fire her in October. Chief Vicki Christiansen told lawmakers that no employee should have to share their story of abuse in front of their harasser. Management is required to separate offenders from victims, Christiansen said. No participants were required to talk. The agency did everything it could to make the sessions comfortable, Christiansen said, and should have also offered other options like speaking privately with a civil rights professional. Lawmakers at Thursday’s hourslong hearing were presented with a dichotomy: an agency that promises it has made progress in addressing harassment and reprisal, and Reed, a former employee backed by an open letter signed by 60 other women, all of whom who say the changes amount to a “band-aid” to deep-seated problems. The House Oversight Committee held its second hearing in about two years over misconduct and retaliation within the Forest Service. Watch the hearing in the player above. It was the latest development in a monthslong spotlight on sexual harassment, assault and retaliation within the agency. In a PBS NewsHour investigation earlier this year into sexual misconduct and retaliation in the Forest Service, 34 women across 13 states described a “hostile,” male-dominated workplace, where harassment, bullying and assault is a deep-rooted and persistent part of the culture. She acknowledged the fear of retaliation among employees and their mistrust with the formal reporting process. Trust in leadership has also been diminished, Christiansen said. Nevertheless, the Forest Service has taken action, the chief said. “Please know, change is occurring in the Forest Service. Our employees can see it,” Christiansen said in her opening remarks. Reed, along with some of the lawmakers on the committee, weren’t as convinced. The testimony came at the second hearing in about as many years focused on misconduct and retaliation in the agency. At the hearing, the chief said the agency has received 1,490 complaints since August 2017. Of those, about 55 percent have gone through a complete investigation. About a quarter of completed investigations have found substantiated misconduct, and of that group, just more than a third involved misconduct of a sexual nature, Christiansen said. Misconduct extended all the way to the top of the agency, according to Reed. Reed told the House committee Thursday that Tony Tooke, the former head of the U.S. Forest Service, groped her buttocks in October 2016 while she and a group of other employees waited to be seated at a restaurant. She believes that she was fired in part because she reported that incident, along with other harassment she reported during her more than three years with the agency. The PBS NewsHour’s William Brangham joins anchor and managing editor Judy Woodruff for an update on abuse and retaliation within the U.S. Forest Service. Tooke stepped down in March 2018, days after the NewsHour’s investigation and amid claims of misconduct against him. The United States Department of Agriculture told the NewsHour at the time it had “engaged an independent investigator” to look into those claims. The allegations Reed put forward about Tooke weren’t discussed at length in Thursday’s hearing. Christiansen and USDA Inspector General Phyllis K. Fong told the committee several times that they were unable to comment on individual cases. Ahead of the hearing, the committee requested documents from several Forest Service leaders, but Democratic Rep. Elijah Cummings of Maryland said there were “inappropriate redactions” among the nearly 1,500 pages that were provided by the agency. 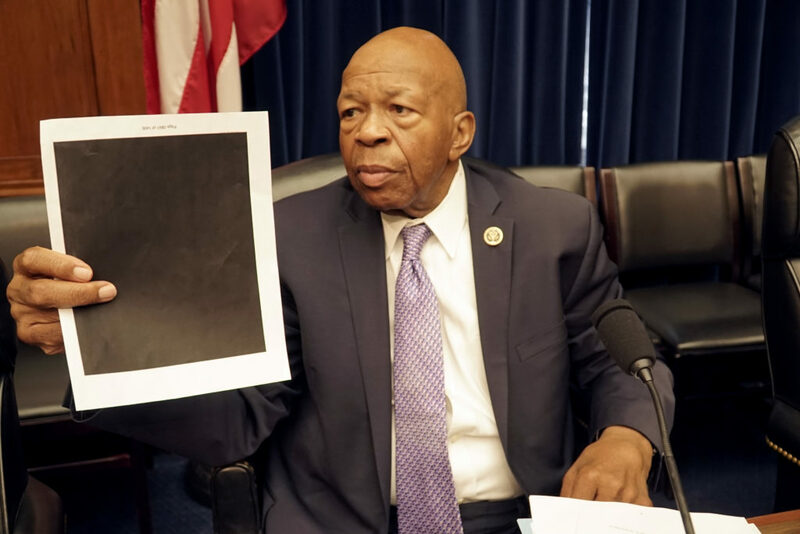 Later, the congressman held up a nearly blacked-out page to demonstrate the extensive redactions. Christiansen said she wasn’t involved with the redactions. After Tooke’s departure, and after an initial hearing in 2016, the agency promised reform. In the past two years, it changed how it reports and investigates harassment claims, including through a new anti-harassment reporting center, outside investigators and revised internal policies on inappropriate behavior. 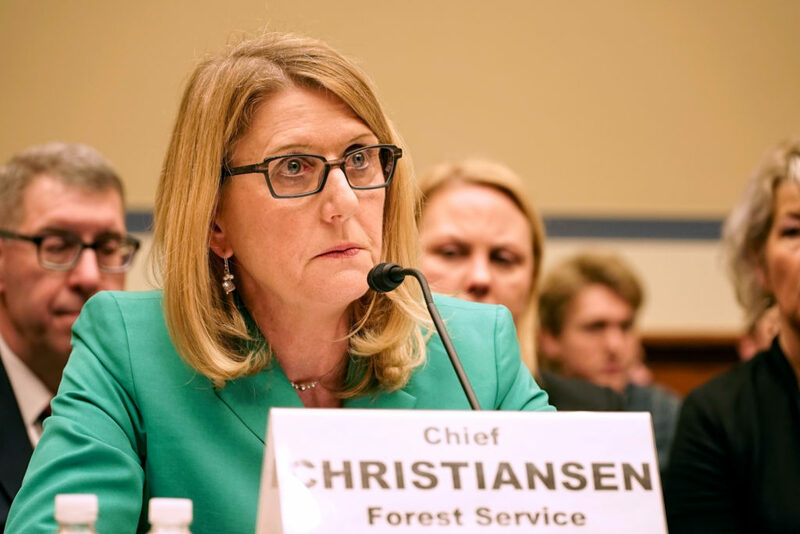 Christiansen said the Forest Service was also conducting an agency-wide survey on the work environment, and, from those findings, may further revise its anti-harassment policy. “I know what it means to encounter harassment and discrimination in my workplace,” Christiansen told the committee. Christiansen said she faced harassment as a young Washington state firefighter that no one should experience. And those past experiences, the chief said, fueled her commitment to the Forest Service and creating a pathway to no harassment within the agency. “We are coming to terms with our past. We are listening to employees, and we are learning from experiences they shared,” the chief said. However, several Forest Service employees said there hasn’t been enough done to combat harassment and retaliation. In an open letter to Christiansen, 60 current and past Forest Service employees said despite the concerns from Congress and the exposure of the problems through the media, the U.S. Department of Agriculture and the Forest Service “continue to ignore our complaints and continue this culture of abuse,” even after the changes made by the agency. Tooke’s departure was an opportunity for the Forest Service to “take decisive action to stop the harassment and hold supervisors and managers accountable,” the employees wrote. “It was our expectation that the agency would acknowledge those of us who have been coming forward (many of us for years), and include us in problem solving initiatives. This did not happen,” the letter read. The letter of support underscored Reed’s testimony. In March 2018, more than a year after the incident with Tooke, Reed spoke for the first time about the interaction during an internal fact-finding investigation conducted by the Office of General Counsel for the Agriculture Department, which oversees the Forest Service. Reed repeatedly told the investigator that she’s worried about retaliation, that she and the men could lose their jobs if they came forward about Tooke. “So I can tell that you have a real concern about possible retaliation,” the investigator asked Reed, according to a transcript of their conversation. Reed said she experienced “intolerable” working conditions throughout her time in the Forest Service. Her first assignments in the Forest Service were at a regional office in Montgomery, Alabama. There, Reed said she was “unwelcome” as a woman scientist and “seen as a sexual object.” “Male employees told me because I was a woman I was not qualified for my job,” she said, and described how co-workers would repeatedly verbally and physically mistreat her in the workplace. Reed said she didn’t report her supervisor’s behavior because she wanted to avoid conflict with her boss at her new job. “I also feared retaliation,” she said. For several months, Reed said she endured yells, threats and unwanted touching of her shoulder from her supervisor. On several occasions, he yelled “to the point I would hyperventilate and start crying,” she said. Reed also said the male supervisor once spat in her face. When the incidents were eventually escalated through formal complaints with the Harassment Reporting Center or through an Equal Employment Opportunity Commission counselor, the harassment worsened, Reed said. Two complaints prompted internal investigations by the Harassment Assessment Review Team also resulted in “unsubstantiated” findings. And after talking with the investigator about Tooke, Reed said she received a seven-day suspension, and a marginal performance rating. In May 2018, she and her supervisor was separated, and she was placed on a performance improvement plan, which the agency told her she failed two months later. A Forest Service spokeswoman said the agency cannot speak to the specifics of individual cases. Employees are discredited despite a pattern of harassment from a repeated offender, Reed said in her remarks. “This is happening to many, many women all over the Forest Service,” she said in her prepared statement. How quickly can the Forest Service change its culture? Several committee members wondered out loud how much time it will take for the Forest Service to reverse its culture. Rep. Will Hurd, R-Texas, asked the chief how a change, such as bringing in third-party investigators, would resolve the mass employee distrust in the agency’s policies. “To change a culture is multi-pronged,” Christiansen told the Texas congressman. The chief said engaging independent investigators was one action that demonstrated the agency was responsive and transparent in addressing the issue. “This alone is not going to change the culture,” Christiansen said. Three women who are members of a class action lawsuit against the U.S. Forest Service share their experiences. Republican Rep. Glenn Grothman of Wisconsin was more pointed, asking why the chief believes it’s going to take so long to make substantial changes to the culture. Grothman said he didn’t buy that explanation, asking why there couldn’t be more stark changes in the culture, adding that there are realistic expectations elsewhere in society to adapt to new rules. “I just think you’re going too slow,” he told the chief. Christiansen said the Forest Service has been setting the expectations of holding everyone accountable with substantiated conduct. “Our working conditions will continue to degrade. We know some of the signatories here will be illegally fired by that time,” the letter read. 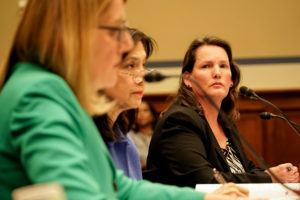 During the hearing, Reed, whose status has not changed since she was fired from the Forest Service, was asked what she’d like to see happen with the agency and its response to harassment going forward. Her answer every time was simple: Terminate the offenders. They reported sexual harassment. Then the retaliation began. Correction: The original version of this story used “accuser” instead of “harasser” when describing Reed’s experience at a Forest Service listening session.